As the title states - what's the state of this? I don't seem to be alone in not having either working (SB2, even with a properly configured swapfile). I recall jake saying we should be using suspend over hibernate now, but I can't seem to find which issue that was in. On top of that, issues like #266 are getting closed without a note or resolution. On top of that, issues like #266 are getting closed without a note or resolution. Yes, see my comment in that issue, "I mean, it's fine as @jakeday does whatever with his repo, but I see the majority of issues get closed without even a note, even though they're not resolved". It's a little confusing, and probably annoying for people that invest time in reporting issues only to see them get closed for seemingly no reason (or with no official reason stated). Unfortunately I'm not familiar with kernel development and can just complain rather than help, but... I would GLADLY contribute $5/mo. if there was an Open Collective account to donate to. I know that contributors to this project have their own dayjob or projects for actual paying clients, but MAYBE if people donated it would help making some extra time for working on this instead. I think most of the Surface devices can suspend correctly even on a non-patched kernel. only means we cannot achieve s0ix yet. sudo su -c "echo 1 > /sys/power/pm_debug_messages"
sudo su -c "echo 0 > /sys/module/printk/parameters/console_suspend"
sudo su -c "echo 1 > /sys/module/printk/parameters/ignore_loglevel"
I have set my laptop's screen to go blank when I close the lid (so, no suspend). Yet, when I open it again many times drivers get unloaded: touchpad, touchscreen, sometimes screen will not turn on again. Is there any way I can debug this behavior? Does it have anything to do with suspend? I have no idea why touchpad, touch input and screen crashes even on going into screen blank. I also frequently use only screen lock (no suspend) but with no problems. sudo su -c "echo 'screen lock on GNOME' > /dev/kmsg"
I'm experiencing now a crash when lid closed and going into blank screen on recently released GNOME 3.32 Wayland session on Arch Linux (no problems with Xorg session). This is absolutely not related to kernel, but just for your information. Mar 17 00:38:33 localhost systemd-logind: Lid closed. Mar 17 00:38:50 localhost systemd-logind: Lid opened. Mar 17 00:39:07 localhost systemd-coredump: Process 1586 (gnome-shell) of user 1000 dumped core. @versipellis Suspend is functioning better than hibernate at this point, and several issues have been with hibernate not being setup properly. It seems several assume just having a big enough swap and enabling hibernate is good enough, but it's not. I would personally rather use suspend at this point and would recommend that. It's more stable and easier to setup. @nkkollaw As I mentioned in the issue you pointed out for your comment, I usually try to comment on issues before closing them. If they are getting closed, I've either checked that they are fixed or they are tracked in another issue and it's just a duplicate. Sometimes I make mistakes, and I apologize for that! @jakeday: of course! Your work is a miracle since I can actually use Linux on this awesome laptop. I just wrote that because it was confusing. In addition, some issues that get closed are not solved on my end even after upgrading and restarting, which adds to my confusion. I guess however that on your system and/or with a clean install they are absolutely solved, and my system has some specific configuration that stops certain things from working. What do you think about my Open Collective comment? I know you don't do this for money, and have no idea if enough people use this projects to raise enough for it to make sense, but if there was let's say $500-1000/mo. it would be appreciated, I guess? I would be happy to contribute with $5/mo. as long as I use the Surface Book as a laptop (which I plan to do for many years). I really wanted to contribute as well, but unfortunately PayPal isn't an option. Also, someone in Reddit mentioned this, and I totally agree with them, we really need a wiki where it is easier to document these quirks and fixes. @nkkollaw I'll do a better job at explaining when issues are closed as well as getting others to verify. I want to prevent any cofusion! I like that idea of an Open Collective, but going that route we would need to ensure any and all contributors can participate. What are your thoughts on that? @hjr265 I opened up the Wiki on this GitHub repo and put some placeholder info there. Anyone should be able to edit it. Would that be a good start? @jakeday : I've used Open Collective only once, and don't know if multiple people can share contributions. MAYBE the best way would be to use Open Collective for the project, and then you use some or all of the money could go towards Bounty Source, ex. a bug or feature is assigned an amount according to difficulty, and at that point whoever fixes that bug gets the money--giving money to contributors directly. I think that would be fair for anyone. elementary OS uses this approach and it works for them. I also don't know if one can setup donations on Bounty Source directly without going through Open Collective. Since I can't do any kernel development or patching I can help by looking into those options, if you think you'd entertain any of those or a mix of the two. Suspend is functioning better than hibernate at this point, and several issues have been with hibernate not being setup properly. It seems several assume just having a big enough swap and enabling hibernate is good enough, but it's not. I would personally rather use suspend at this point and would recommend that. It's more stable and easier to setup. I'm asking because I'm not even sure if installing it anew and choosing "no" would retrieve that function, as the script only does something when choosing "yes"
There is a way to get suspend back. The script replaces the files /etc/systemd/system/suspend.target and /etc/systemd/system/systemd-suspend.service with symlinks to the appropriate hibernate files, but it does back up the originals. So you simply need to restore them. I'm able to suspend on my SL2 using linux-surface-petercxy 5.0.1-1 on Archlinux using systemctl suspend (with the service scripts pointing to suspend not hibernate). I have to hit the power button to turn it back on and everything seems to work. However, if I suspend a second time without rebooting, the screen will come back but my wifi, keyboard and touchpad don't work. Is this the expected behavior as things currently stand or should I try to dig into it some more? @tmarkov could you tell me where to find those backups? @sokolowistan96 In the same directory. Here's what I have in my files. Note that there are two and you need to fix both. @tmarkov it seems to be working now but you won't believe how & I don't think it's a healthy state haha. 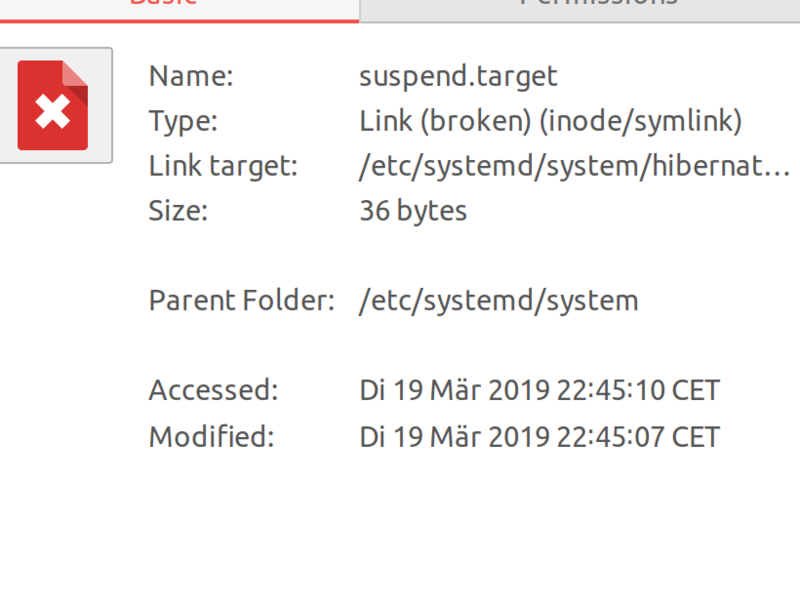 I looked up the properties of suspend.target and saw that it points/links to a file called hibernate.target in the same directory (which doesn't even exist in my file browser?). But here is the big issue... my surface book 2 started doing a weird droning noise while on ubuntu and while I can't believe that this is somehow connected to breaking a stupid link-file, it occurred for the first time ever after just now. Edit: The noise persisted even after a restart to windows, however not when i shut down completely and then restarted... very weird indeed, almost certainly not related to deleting that link but probably related to linux itself.. I may open up a seperate issue for that, if it persists as it's kind of off topic. @sokolowistan96 Originally, you have four files. suspend.target, hibernate.target, systemd-suspend.service, and systemd-hibernate.service. Clearly two handle suspend (and contain what I posted above), and two handle hibernate and you have them. The switch is done by deleting the suspend files (it's actually supposed to back them up by adding ~ to the end of the file name, don't know why you don't have backup) and replacing them with link to the hibernate files, so when the system tries to susuend, it processes the hibernate files instead. So, to properly undo the switch you simply need to delete the link and restore the original files. If it works with broken links that point to themselves you can leave it as is, I guess. I would expect something to be broken because of that (maybe it's something you don't use). @sokolowistan96 : sorry to hack the thread, was is your icon theme? Looks awesome! Haha yeah I love it. @sokolowistan96 Right click - new - text file? Maybe it's called empty document instead. But they're just normal regular text files. Also, not to spam here, can you ask any further question on gitter https://gitter.im/linux-surface/support?source=orgpage? @sikandar566 Err, isn't your quoted command deleting the hibernate target? So, systemctl suspend seems to work, after reverting the setup.sh changes, mostly.. Except I get the hissing sound after resuming from suspend. Is anyone else getting this? Also, suspending my SB2 seems to still cause it to generate pretty significant amounts of heat over time. Anyone else facing this? No I don't get any hissing sound on my SB. I get perfect thermals while sleeping (edit: while my computer sleeps I meant). EDIT : I mean SB1, I don't have SB2. What is the SSD temperature before and after long (like 1 hour) suspend? sudo smartctl -a /dev/nvme0 | grep -e "Temperature" -e "Model Number"
So what is the recommended configuration now? I never thought about it, as I for years simply disabled suspend in favour of hibernate on my surface, and then I stumbled over this bug report. So nowadays suspend is possible? Does that mean that only the two systemd-units for suspend don't need to be symlinked to hibernate, or are the changes to logind.conf and sleep.conf no longer necessary? To add my experiences: For my Surface Pro 3, suspend is really unreliable, most of the time it simply suspends itself again after waking up for a few seconds. Only hard poweroff helps. Hibernate works better! On Surface Book 1, suspend works very unreliably as well. I have roughly the same experience as @Larx after getting suspend to work as described by @tmarkov Most of the times, I cannot even wake up my machine after suspend. For the record, I have the version with 8GB memory and configured a 10GB swap space. Suspend works constistantly on my SB1 @Arch also 8GB ram 10gb swap. What does not tho is hibernating. Sometimes hibernate work sometimes it does save and therefore go back to the state before turning off but actually do not turn off like the screen is turned off but the PC is still on and I can still change the keyboard backlighting (I need to force turn off through power button on the top). Very annoying as I'm using suspend-then-hibernate .